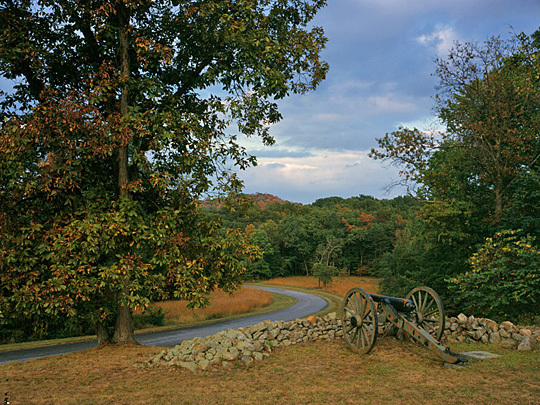 Photo: Gettysburg National Military Park. [Historic American Engineering Record [HAER, PA-485, 1998, David W. Haas, photographer.] memory.loc.gov, accessed March, 2007. County government offices are located at 111 Baltimore Street, Gettysburg, PA 17325; Phone: (717) 337-9820. Created on January 22, 1800 and named in honor of President John Adams. Settled by migrants from both Maryland and eastern Pennsylvania, Adams County has always had a strong German ethnic strain and a farm-based economy. Although it once led the state in wheat production, general farming eventually prevailed, and apples are now its most famous product. Even though John Studebaker's wagon works gave his name to a major Detroit car manufacturer, the county has never been industrialized until recent decades. The Battle of Gettysburg, July 1-3, 1863, an irreparable loss for the Confederacy, spawned a large tourism industry. Gettysburg College, at first named Pennsylvania College, was founded in 1832. President Dwight D. Eisenhower's farm near Gettysburg was his private residence during and after his presidency. Pennsylvania Historic and Museum Commission, www.phmc.state.pa.us, accessed December, 2006.